My grandfather passed away in 2007 at age 95, but in college I recorded several conversations with him. He talked about the Depression and the desperation he and many Americans felt. [featured-image single_newwindow=”false”] He talked about learning to box so he could defend himself against the neighborhood bullies who called him a Polish Jew. He talked about sneaking into gatherings in 1930s Milwaukee of a group called the The Bund, which were American Nazi sympathizers. What happened in Charlottesville last week would not have surprised him. He lived through it once before. [Join with other Christians and Jews in this Facebook Group dedicated to fighting antisemitism.] But it did surprise me. I grew up with little antisemitism. My application to seminary said the age of persecution was over, and Jewish life needed to focus on more positive engagement and inspiration. I was naive. Antisemitism has reared its ugly head again. 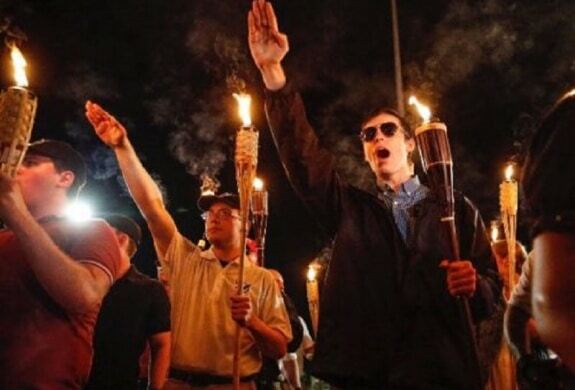 The Nazi symbols and signs proclaiming in Charlottesville “Jews will not replace us” scared me and my children. I thank God for you—my readers and friends—who are committed to a different world. A world we can worship and live in freedom and respect. Our task is to help preserve that world our children and grandchildren. Do we have grounds for hope? Well, our ultimate hope rests in God. But I also take comfort from the Book of Genesis. It begins with an angry murder. Cain kills Abel. Later Jacob steals the birthright from his older brother Esau. Then Joseph’s brothers sell him into slavery. Yet, at the end of the book of Genesis, Joseph and his brothers reconcile with one another. They forgive. They live in peace. My hope is our country follows our similar path. What can you do now? Join this Facebook group to keep up with ways of fighting antisemitism. It is called, fittingly, Christians and Jews Fighting Antisemitism and is the first of its kind.